Autumn has long been my favorite season of the year — colorful tree foliage, cooler air for comfortable hikes, clear cerulean skies, cozy sweaters…I could go on. But this is also a season tinged with sadness for the end of summer. Lately I’ve been feeling a bit gloomy about the impending end of dragonfly season. It’s frustrating to have such a short time each year to watch these fascinating insect predators. I’ve written before about the Ohio Dragonfly Survey and how you can contribute to it. I’ve submitted many records of my observations to the survey in the past two years, and look forward to adding more in the third and final survey year next summer. A few weeks ago I got a message from one of the survey coordinators pointing out that they would like a few 2018 reports from Fulton County, and asking if I would keep that in mind while I was out and about. I live in Lucas County, which has a few very active odonata observers, including one of Ohio’s experts. So there’s not much chance of me finding something here that hasn’t already been documented. But Fulton County is a rural county just to the west of Lucas County, and it has far fewer people reporting odonata sightings. So that means I can more easily make a meaningful contribution to the database with my sightings there. So the other day, after doing some online location scouting and armed with a list of three target species, I drove west through the corn fields. 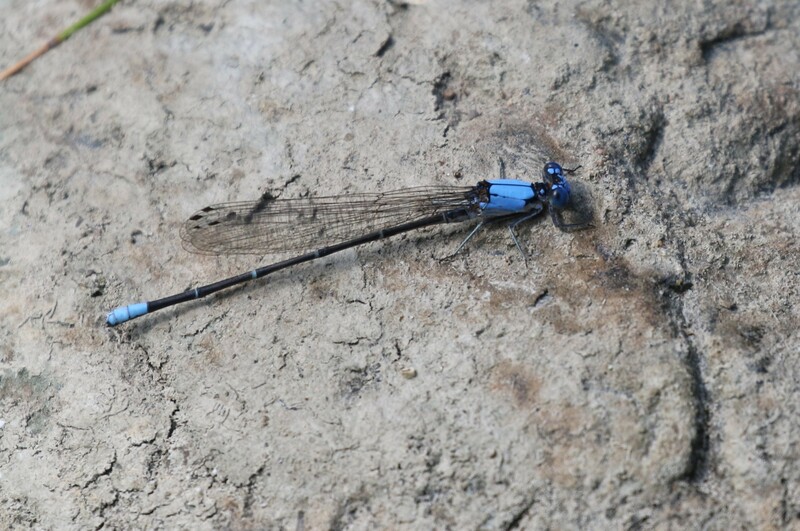 The three target species were all damselflies: blue-fronted dancer, fragile forktail, and stream bluet. I knew one good pond location from earlier visits in that area, but I knew that spot wouldn’t be likely to have the dancer or the bluet, both of which are usually found near rivers or streams rather than the pond that I was headed to first. I was pleasantly surprised when the first bug I saw was one of my targets, the fragile forktail. He’s easy to identify because of the green exclamation mark on his thorax. I spent about 45 minutes more at this pond location, documenting some other species, before heading off in search of flowing water. I figured, okay, I can walk on this first section as long as I don’t go past the chain and the sign. I wasn’t going to do any harm, and it didn’t look like anyone had driven that driveway in a long time; it was full of deep ruts and bordered by tall weedy vegetation. And amazingly, I found my second target species on that driveway: blue-fronted dancer. I almost did a happy dance after I got my photograph for documentation. I also got this pretty picture of a viceroy butterfly nectaring on loosestrife. So, two down, one to go. The only other spot I could find with the potential for running water was Harrison Lake State Park. From the map view I’d noticed there was a dam at one end of the lake, with potential access to the stream below it. So off I went further west. I’m sure it had a lot to do with the beautiful weather on this day, but this park impressed me immediately. I saw that their campground was full of people on this late summer Friday, but somehow it wasn’t noisy. It felt peaceful and relaxing. And even better, there was access to the stream below the dam, just as I’d hoped. And this is where something exciting happened. I’d found a couple interesting species (orange bluet and dusky dancer), and was taking photos of them and just quietly observing the water. I was looking down at something on the ground, and as I lifted my head I saw an enormous pair of green eyes speeding directly toward me, only a dozen feet away. I barely had time to think “River cruiser!” when it whizzed past me like a green bullet and went high up into the trees behind me. I spent a half hour searching for it, desperate to document it for this location. I had a hunch it could be a species that hadn’t been recorded there before. But, alas, I didn’t find it again. I eventually gave up and walked back up the hill to the top of the dam, and then slowly toward the parking lot. I was enjoying the beautiful day, but couldn’t help feeling a bit dejected after the close encounter with the river cruiser and then losing it. I was in the parking lot, about 100 yards from my car, when –BZZZZZT! — something big flew past my head and perched in a tree 30 feet above me. I knew what it was before I saw it: River cruiser! I started taking photos immediately, not knowing how long it would stay there. My first impression was that it was a Wabash river cruiser, a hard-to-photograph hybrid species. And indeed, that’s what it was! I couldn’t believe my luck, and took probably 70 photos of it, even though it barely moved. I always try to get multiple views of any dragonfly, because sometimes you need to see multiple field marks to confirm an identity. The diagnostic field mark on this species is the moth-shaped yellow mark near the end of the abdomen. And not only did I get a killer view of this dragonfly, I photographed a really interesting behavior: the transfer of a sperm packet. Prior to mating, the male has to transfer sperm from his primary sexual organ to his secondary genitalia, where the female will have access to it when they link their bodies in the mating process. This photo shows him doing exactly that. And this made me believe that I’d seen two different individuals; the first one I saw below the dam might have been the female. I felt great that I’d gathered some valuable data for the Ohio Dragonfly Survey (the Wabash river cruiser did turn out to be a new species for Fulton County), and I left that park with a smile a mile wide. I’m so glad I take the time to write about these nature experiences; not just to share them with you, but for myself too. They’re fantastic memory joggers as I reminisce in the winter, sitting beside a crackling fire counting down the days until the first ode sighting next spring. I’m also planning to do some hard-core studying this winter, as I’ve been enlisted to lead the annual dragonfly field trip for Toledo Naturalists’ Association in June. I don’t need to be an expert by then, but I’d like to be as prepared as possible so everyone has fun and learns something on our outing. 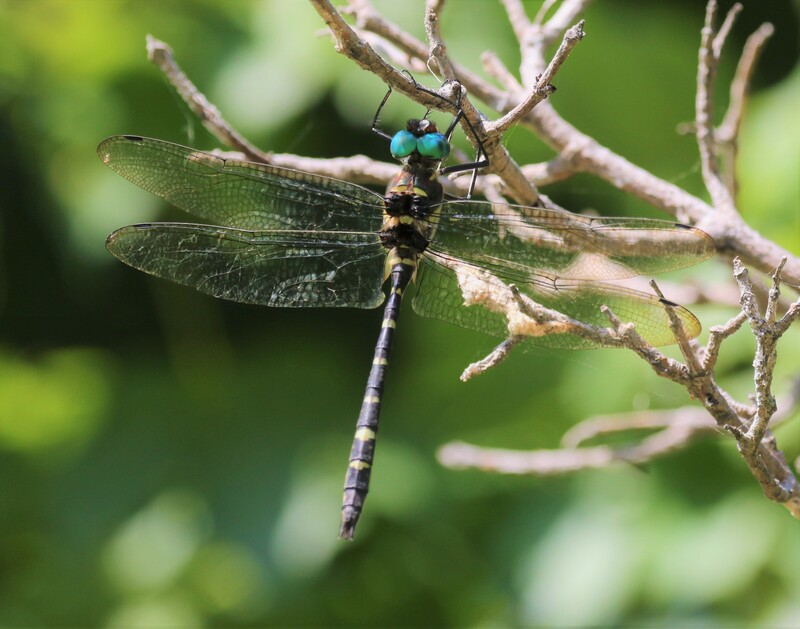 This entry was posted in Insects and tagged citizen science, damselflies, dragonflies, insects, odes, odonata, Ohio, Ohio Dragonfly Survey, Ohio Odonata Society. Bookmark the permalink. 7 Responses to A Speeding Green Bullet! Exciting times and loved following your adventure. How I’d love to join your field trip! 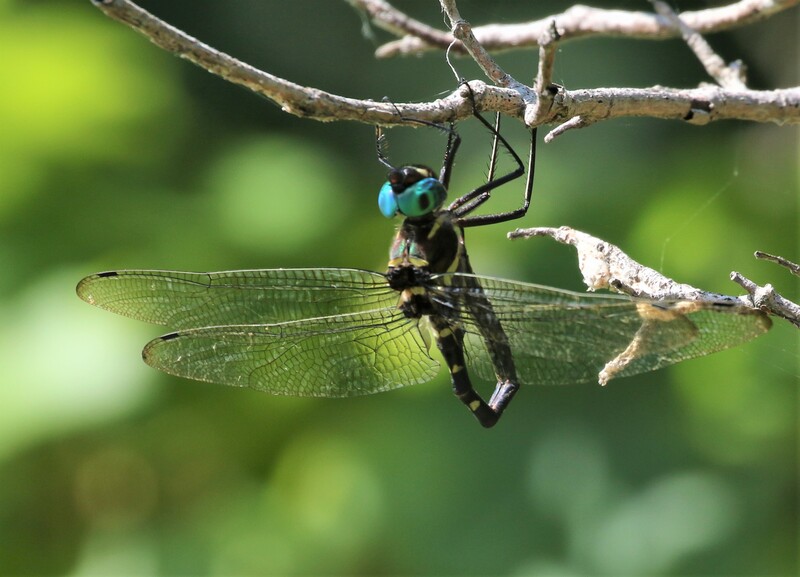 “I’ve been enlisted to lead the annual dragonfly field trip for Toledo Naturalists’ Association in June.” You must give me the date, I want to be there. I am feeling a little blue about summers end as well, but before long and late March rolls around and then wildflower season starts !! 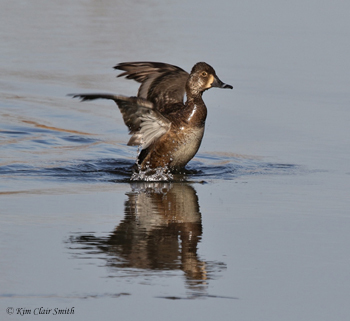 And at least there will be ducks to get me through the winter! You had to expand your searches to the next county and that was smart thinking. Looks like it paid off. Your photos are really professional and it always surprises me that you name the flower the insect is on too.